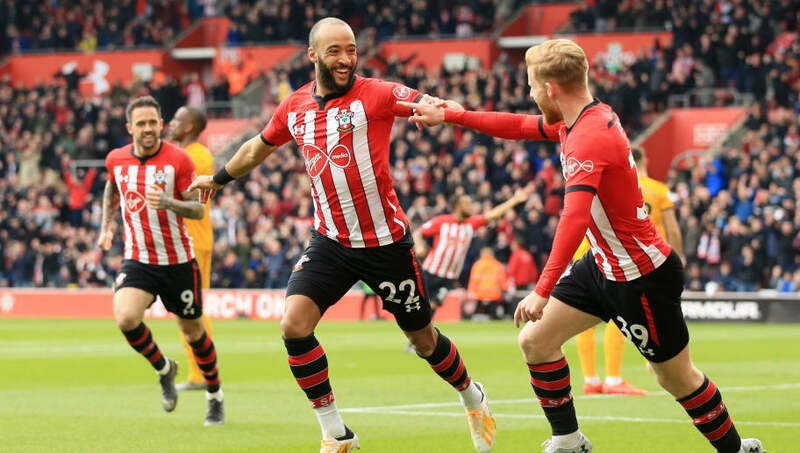 Southampton picked up a vital win in their relegation battle, as they beat Wolves 3-1 on Saturday afternoon. Southampton took the lead after just two minutes, as Nathan Redmond swept home Josh Sim's low cross. The Saints forward got to the ball ahead of Connor Coady, as the hosts went ahead with the first action of the game. Wolves drew level in the 28th minute, thanks to a towering header from Willy Boly. The Frenchman rose highest and beat two Southampton defenders to the ball, before power a header into the top corner to equalise. However Wolves were level for just 118 seconds, as Southampton soon restored their advantage. Danny Ings played a wonderful pass into the box, as Redmond ran onto it and chipped Rui Patricio to score his second of the afternoon. The Saints wrapped up the three points in the 71st minute, as Shane Long pounced on the ball and poked it home to well and seal a massive win for the hosts. Here's our breakdown of Saturday's Premier League clash. ​Southampton started the game brilliantly going ahead after 94 seconds, and they managed to maintain their strong performance throughout the game. It was a magnificent performance in a crucial game, as Southampton certainly turned up when needed. Ralph Hasenhuttl will be delighted, but their safety is not yet confirmed as they move eight points clear of the relegation zone. Nonetheless, it was certainly a massive win. Starting XI: Gunn (6), Vestergaard (7), Yoshida (7), Bednarek (6); Bertrand (6), Hojbjerg (6), Ward-Prowse (6), Valery (6); Redmond (8*), Ings (6), Sims (7). Substitutes: Long (7), Romeu (6), Stephens (N/A). STAR MAN - Nathan Redmond was superb for the Saints, with his two first half goals critical in delivering the win. His movement and work rate in the final third were excellent, with his two goals capping off a big performance from the Englishman. Following their ​devastating FA Cup semi-final defeat last weekend, ​Wolves were determined to return to winning ways. However they started in the worst way possible, losing concentration going behind within two minutes. They were instantly on the back foot, but remained focused. Nuno Espirito Santo's side got a deserved equaliser, but then conceded straight away. Wolves struggled throughout the second half, and were perhaps lucky not to lose by more. Starting XI: Patricio (7); Boly (7), Coady (5), Saiss (6); Jonny (6), Moutinho (6), Neves (5), Dendoncker (7*), Doherty (6); Jota (6), Jimenez (5). Substitutes: Traore (6), Gibbs-White (6), Costa (N/A). STAR MAN - Though there was little individual quality, Leander Dendoncker put in a good shift in midfield. He played well and created some of Wolves' best chances, as he showed more positive signs in a poor display from the visitors. Southampton are back in action next Saturday, as they play the first of two away games within three days. First they travel up to ​Newcastle on Saturday afternoon, before playing ​Watford at Vicarage Road on 23 April. Wolves have back to back games at Molineux, starting with the visit of ​Brighton next Saturday. They then face a huge midweek game, as they hope to extend their outstanding record against the big six against ​Arsenal on 24 April.